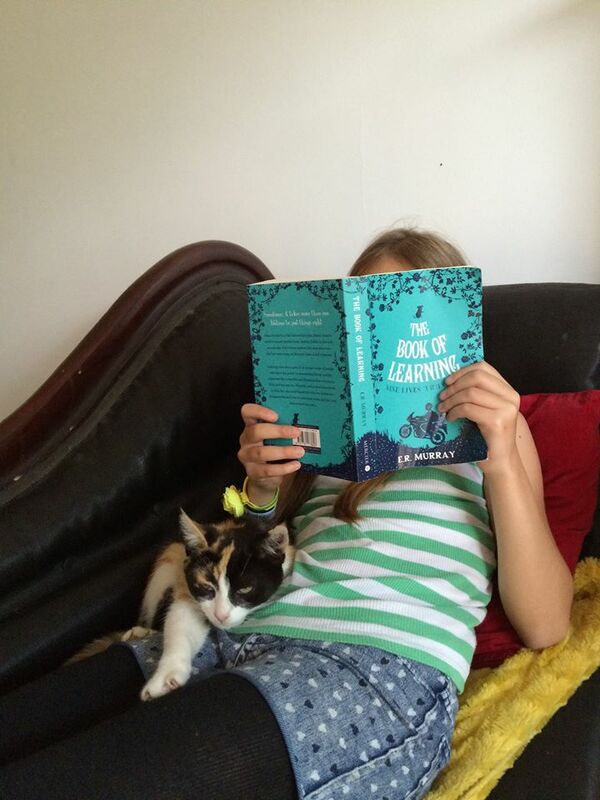 The Book of Learning by Elizabeth Rose Murray © 2015. Dublin UNESCO City of Literature 2016 Children's Choice. It is available from Mercier Press. Book Trailer by Alan Early. Cover design by Sarah O'Flaherty. 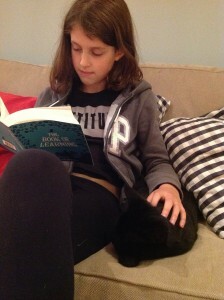 We asked three young readers to tell us their initial reactions to the book, and for any questions they might have for Elizabeth, who kindly joins us here. Thank you Elizabeth, and thank you Maia, Abby and Lucy. Over to you! I thought that The Book of Learning was a really good book. I loved the way there were so many questions and mysterious people. It actually felt a bit creepy at night when I read the scary bits, like when Icarus Bean jumps out of a wardrobe and tries to attack Ebony! I really think that people should read the book. If you like scary, mysterious and adventurous books, and even if you like animals, it’s a really great book! Maia: How many times did you rewrite or change the story before it was published? Elizabeth: This is the first book that I tried to get published, so it was a really long journey with many drafts along the way. I always write a first draft in a month, as I need to get lots of words down before I can form the idea. It’s a bit like being a sculptor; I need clay to mould. But I call this initial draft a draft zero, because it’s really rubbish. In total, there were around 12 drafts of this book. 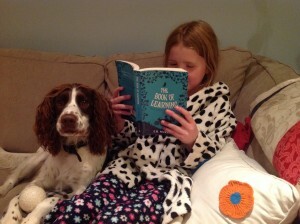 Abby Stewart (aged 9), with Belle (aged 2). I really enjoyed reading The Book of Learning. I would definitely recommend this book to a friend. I loved the rat Winston, and the way he could talk to Ebony and understand what she was saying. I also liked the character Icarus Bean and the way he was always creeping around in the shadows. I actually loved all the characters in their own special way and I loved the way they were all different. I would love to read the next book! Abby: Do you have a pet rat? If so, did you use your rat for Winston’s character? Elizabeth: I don’t have a pet rat but lots of my friends did when I was a teenager, and I always wanted one. Rats are very smart and emotional creatures (when they’re not in sewers), and you can train them to do all sorts of clever things. I wanted a friend for Ebony that she could rely on. A rat suited perfectly. Lucy McKee O’Brien (aged 9) with visiting kitten Tiger (aged three months). I loved everything about this book so it’s hard to say which parts I enjoyed the most. Probably it was when things got really creepy – like the moment when Ebony sees herself in the mirror. Things started getting really weird and exciting and I couldn’t stop reading! I also fell in love with Winston the rat – I’d love to have a pet rat (but we have lots of cats so it wouldn’t really work out)! Lucy: How did it feel to see the cover of your book for the first time? Seeing my cover felt incredible! I had an ideas meeting with the editor and cover designer at Mercier Press, and we talked about covers we liked and didn’t like, and what we thought would suit the book. We came up with the idea of using the motorbike image, and after that, I had to wait and see. It was important to me that the cover reflected the tone and atmosphere of the story; when I saw it, I was so happy, I did an embarrassing little happy dance! The cover designer was Sarah O’Flaherty – isn’t she brilliant? Everyone: Do you already know how the last book in the trilogy ends? We are dying to know what happens next – when is the second book out? I’ve always known what was going to happen at the end of the second and third books, and I also knew some of the scenes in both – but the rest is a complete surprise. I don’t plot or plan; instead, I feel my way through the story by writing, rewriting, and living in the characters’ heads. I thought I might need to plan for Nine Lives Trilogy Book Two, seeing as it’s a continuation, but that hasn’t happened at all. I’m almost finished a draft of this, ready to hand over to the publishers for editing. It’s called The Book of Shadows and it will be out late August/early September 2016 – I hope you’ll like it! The Book of Learning is available from Mercier Press. More thoughts on Elizabeth's book can be found on writing.ie - and you can read more children's reviews of this, and other books on the wonderful Looking Glass site. You can find out how Ireland influenced Elizabeth's decision to become a writer in The Irish Times, and find out more about her writing life on her blog, follow her on Twitter or keep up with book news on her Facebook page.